Some time back we heared a news - There is not any tigers in Sariska Tiger Reserve. It was unbelievable; after many years of the prestigious 'tiger reserve program' all we achieved in Sariska was a Tiger Reserve without any tigers!!! Obviously Tigers are not in any foreign tour neither they are all dead by natural reasons. If the national animal doesn't have any protection in a 'supposedly highly sensitive tiger reserve' then anyone can imagine about the future of other endangered animals. Sariska's story- after the above mentioned shocking news- goes on in this way. After sawing that there is no Tigers left in the reserve, authorities moved one male tiger and two female tigress from Ranthambore National park to Sariska. But the problem about this relocation is the way they selected the tigers. Before relocating they didnt followed IUCN conventions. Neither they performed any DNA tests nor any territorial analysis. So it is posible that they all come come from same family. If its so then this will leads to 'inbreeding' and will be a disaster in long term, moreover it will add more strain on the small population of tigers in Ranthambore reserve. Above all what is the guarantee about these newly deployed tiger's security in Saraiska? As long as there is tigers in other reserves they can relocate but aftr that? "Although forensic test reports were yet to come, we suspect the cattle died after grazing on poisoned grass -- some toxic chemicals laced with salt might have been sprinkled on a patch of grassland," Kaziranga park director S.N. Buragohain told IANS. According to the last census there are about 2048 Rhinos in Kaziranga out of a mere 3000 in the entire world. 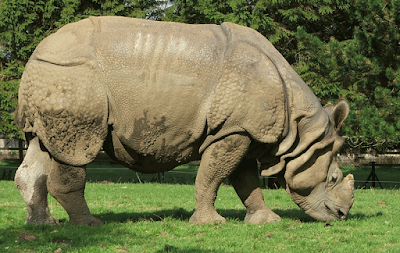 Like most of the other endangered species these Rhinos too is being killed for their body parts. In Rhino's case people want their horn. As of now 2048 may be a large number but there is all the possibility for the repetition of Sariska's history. Soon there will be tigers and tiger reserves on the papers only, and other endangered animals future too may not be different. Soon all the forests will be wiped out the so called industrialization. We have powerful laws in paper, we may add more and more sanctions to it - on the paper only. Until and unless they are not enforcing there is no use of it. First of all give good weapons to the forest guards and also give them the authority to use it. What is the use of long stick and torch in front of guns? Otherwise we will have tiger reserves without tigers, bird sanctuaries without birds, forest reserves without trees. Future of wildlife is not so dark but people are doing everything they can do make it darkest.